Let’s admit this, when you are choosing a prom dress you want something that would let you steal all the limelight. It is one of the most memorable evenings of your life and you’d want to make the best expression about your style and beauty. It is that evening where you don’t wish to look anything less than a princess. Since your bestie and girls whom you are envious of would also put in equal efforts to look as elegant and beautiful you can’t just be casual about your choice of a prom outfit. You wouldn’t like to let others attract all the attention, would you? It isn’t easy picking the right outfit as there are dozens of styles, designs and colors to choose from. If you have browsed enough though online stores you may have only added to your dilemma! It is often the choice of color that can decide whether you steal the show or regret your choice of outfit forever. So you need to get your choice spot on. The mistake that many make when it comes to choosing a prom outfit is they feel it is only about choosing the right style. And given the choice of styles, cuts and designs that are available these days one can be excused for this mistake. However a flattering style may just not add to your appearance if you get the choice of color horribly wrong. The color of your prom dress should complement your skin tone, the color of your hair and of course your personality. It should be something that adds to your style statement and something that you would carry comfortably. But there are some color shades that suit just about anybody and burgundy is one of them. If you have been looking at latest prom dress styles you would have invariably come across burgundy prom dresses. They are selling like hot cakes now and it can be a good choice. While red has always been the classic color shade when it comes to prom dresses in the recent years we are witnessing a shift in trend towards burgundy. While red isn’t definitely out of fashion as far as prom dresses are concerned most girls prefer to go for burgundy these days. Like red they have the same kind of classy appeal and at the same time have a novelty factor attached to them which red dresses no longer have. Why Choose Burgundy Prom Dresses? You would know that blondes like to go for shades of blue, black and white dresses while most brunettes tend to opt for lighter toned shades. This is where burgundy is something that looks good on everyone. Irrespective of your skin tone and the color of your hair you would look great in burgundy prom dresses. However the biggest plus of these dresses is the fact that they look good on everyone irrespective of the body shape. You can be skinny or plus size and yet this color would look elegant on you. Since burgundy prom dresses are popular you would be spoilt for choice when it comes to picking the right style. From the classic gowns to split dresses and from off shoulder outfits to mermaid dresses you can choose from a variety of styles that have would suit your personality and let you make the statement from the moment you arrive at the prom till you say goodbye to your friends. 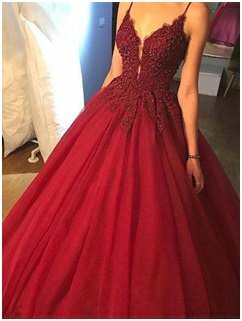 If you haven’t been fanaticizing wearing a certain color shade at your prom for years and open to trying out latest trends you can definitely go for burgundy prom dresses.